Can anyone specify “Where Humanity Stands?”. People like us might not be able to imagine how much pain and sufferings children like this boy has to tolerate at this age for ensuring two times meals every day. This boy who is ten or twelve years old and he has a right to go to school but he cant. 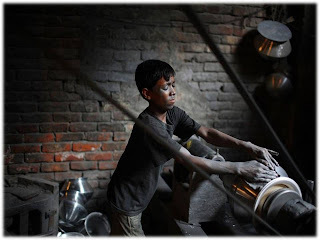 It is very shame to us to see this kind of picture everyday that a children is working with a machine. But there are many soft heart human being who feels sorry for this kind of children and my appeal is only for them, that is… only feeling sorry or sad is not going to make any change in their miserable life. So please step forward and spread your hands so that they can grab it and you can pull them up from their miserable life.